Northwest Creative Imaging offers a full line of custom modular trade show displays that are a hybrid between portable and custom displays. 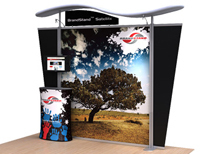 These display systems will make your company stand out at any trade show while remaining well within your budget. Every system uses an extruded aluminum frame to create a unique look. Every kit includes a shipping case so you can pack your entire display in an easy to handle crate that is UPS shippable! The Satellite series of displays are the most affordable custom modular booth on the market. It uses a high quality graphic from China to reduce cost without compromising quality! Starting at $1,474 w/ Graphics! The Tahoe series is a very affordable custom modular display with a unique look. The graphics for the Tahoe are printed in the US for fast and efficient turnaround times and shipping! The Linear BOLD is the newest addition to the Linear line up. Clean lines and extruded aluminum make these displays very appealing. Monitors, internal shelving, and tables can be incorporated throughout the system! Multiple Styles, Over 95% US made! Custom modular displays started to become popular about 4 years ago with the introduction of the Alumalite Classic system. Since then a wide variety of products have hit the market with many different styles and price points. Northwest Creative Imaging offers most of these options on our site. We have spent countless hours reviewing all the options available and have developed a lineup of displays that offer the best value to our customers. 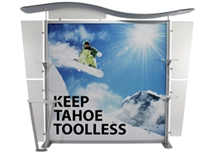 We have some options that are as cost effective as pop up displays making them ideal for exhibitors on a tight budget. We also offer options that can be customized to fit your exact requirements. Custom modular display systems are almost exclusively used for trade shows, but also work great for small conferences and job fairs. 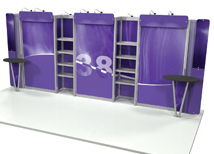 The easy to assemble layout offers exhibitors a modular display solution that retains the look of a custom booth. These systems can be used for 10, 20, and even 30 foot booth spaces. It’s easy to make a 20 foot display into a 10 foot display, and just as easy to add on sections to create a larger system. Extruded aluminum gives the framework a modern appearance, and the canopy makes the display pop. Custom modular displays offer a wide variety of benefits that are not available on most pop up displays. The most popular option is the monitor mount. The extruded aluminum uprights with built in channels offer the ability to mount monitors on both sides. It’s easy to adjust height and use different size monitors. The Pascale line is capable of supporting monitors as large as 60” with the right supports. Shelves and attached literature racks are also available for most of our custom modular systems. These displays offer many benefits that include unique styling and multimedia options. This product line up is a great solution for any exhibitor looking to make a statement at a trade show. We have an article on effective marketing that covers multiple aspects of trade shows including information on how to choose the right display. Our product line was chosen with quality and price in mind. The Satellite and Tahoe systems are economy options that offer an affordable price point, yet still offer the unique look and available options. They are not as easy to customize which is why we offer the Linear and Pascale product lines. Both systems can be customized and modified to almost any configuration. 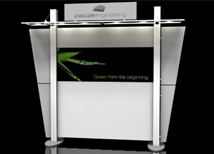 Pascale products are all US made and are the easiest custom modular displays to assemble. Every product we carry has a lead time of 5 days or less and ship from multiple locations in the US. This product line gives NWCI the ability to offer a wide variety of options that are available quickly and meet all of our quality standards.